What was the tar-like substance coating the Pennsylvania Turnpike yesterday? 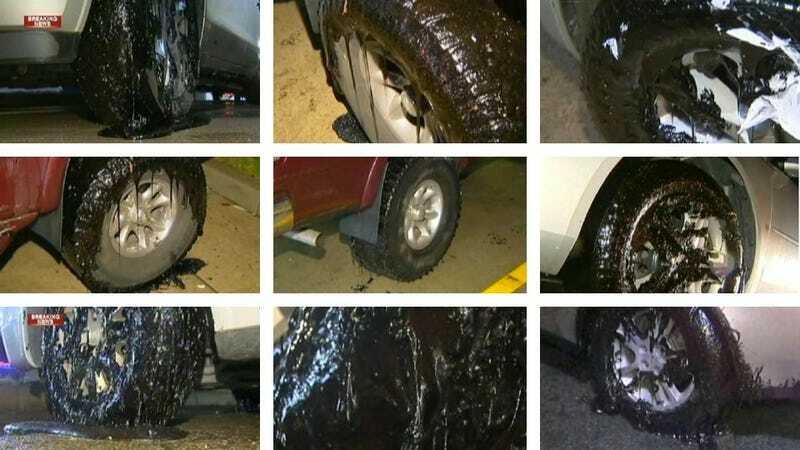 Hundreds of drivers on the Pennsylvania Turnpike near Pittsburgh yesterday found themselves bogged down in a sticky, black, tar-like substance that coated their cars' tires and left them stranded by the roadside. So what was it? Heated driveway sealant. The hot mess rendered about 40 miles of Turnpike between New Castle and the Oakmont Service Plaza nearly impassable, stranding hundreds of drivers and delaying hundreds more, WTAE TV reported. The culprit? A heated tanker truck with a leaky valve. Since it was dark, no one saw the sticky goo until it was too late. It took maintenance crews several hours to clean up nearly 40 miles of steamy sealant using snow plows, according to the Associated Press. Officials said the mess was only spread on the right lane. Thankfully for motorists at the head end of the late-November travel blitz, the Turnpike wasn't shut down during the cleanup.